A barge arrives at the U.S. Army Outpost wharf at Port Canaveral in Florida, carrying two of the three United Launch Alliance Delta IV heavy boosters for NASA's upcoming Exploration Flight Test-1 (EFT-1) with the Orion spacecraft. The core booster and starboard booster will be offloaded and then transported to the Horizontal Integration Facility, or HIF, at Space Launch Complex 37 on Cape Canaveral Air Force Station. 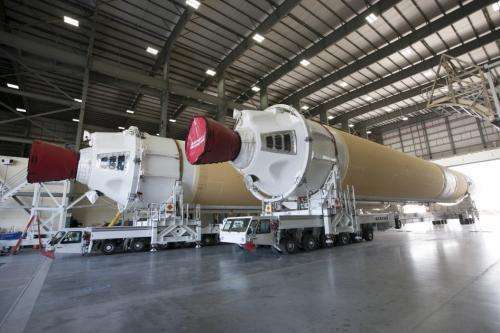 The port booster and the upper stage are planned to be shipped to Cape Canaveral in April. At the HIF, all three boosters will be processed and checked out before being moved to the nearby launch pad and hoisted into position. Orion is the exploration spacecraft designed to carry astronauts to destinations in deep space, including an asteroid and Mars. It will have emergency abort capability, sustain the crew during space travel and provide safe re-entry from deep space return velocities. During the uncrewed EFT-1 flight, Orion will travel 3,600 miles into space—farther than a spacecraft built for humans has been in more than 40 years—and orbit the Earth twice. The data gathered during the flight will influence design decisions, validate existing computer models and innovative new approaches to space systems development, as well as reduce overall mission risks and costs for later Orion flights.